Heart & Sole Running Club Members are passionate about running. Check out their tats and the reasons behind the designs! 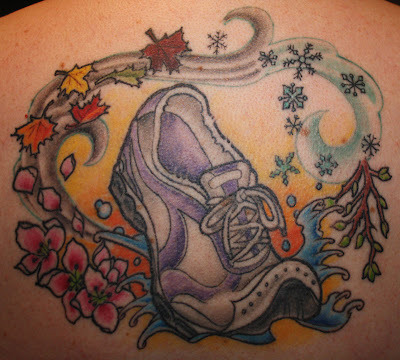 Cindra's Tat - I ran my first marathon on Mother’s Day 2011 and consider it to be among the greatest challenges and accomplishments of my life. During my training I decided that when I completed my first marathon, I would get a celebration tattoo to commemorate the occasion. My daughter drew this picture of me crossing the marathon finish line and on my 48th birthday my son accompanied me to have the picture permanently tattooed on my left calf. Seems a truly fitting way to celebrate Mother’s Day. Darren's Tat - It's got a few different meanings to me. 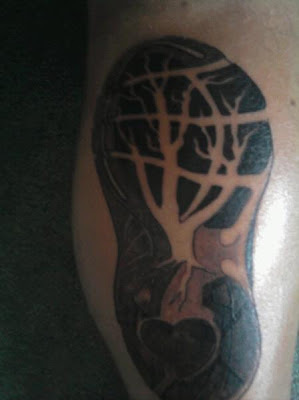 #1 I belong to a really cool and supportive running club - Heart and Sole # 2 The tree stands for family for me. The club is kinda like a running family who have an awesome way to inspire and support others and the tree also stands for Family Support and being run in the club with my brother Jason - he's been a big inspiration and it's awesome to be able to share this with him. #3 The heart also stands for the loving support from others, especially my girlfriend Kelly and all the ways that she helps me to be able to do this as well. #4 It's my way to thank everyone, friends, family, loved ones & everyone from Heart and Sole #5 Its my way to show how much I enjoy running and by being the newer, slightly healthier version of myself. Michelle's Tat - Running has made a permanent mark on my life. It has taught me to believe in myself and realize that if I push my body to be uncomfortable, that I will enjoy health benefits, euphoria and pride beyond what I ever imagined! I spent months day-dreaming ideas that would symbolize my passion, dedication and experience with the only sport that I’ve ever embraced - running. I envisioned a sneaker splashing in a puddle, surrounded by the 4 seasons and all the weather conditions that I’ve run through. My running partner Michelle Alarie drew the concept for me. Voila she made the mastepiece.